With more than two decades in electronic music, DJ Zinc has forged his own path for the outset, apparently winning both the respect of industry peers and fans along the way. Consistently redefining his sound, he jumps between musical genres and is one of few artists who can claim to have had genuine underground and commercial hits across house, breakbeat, UK garage and D&B, having sold over 1,000,000 physical records across his own productions and labels. Now possibly established as one of the foremost house producers in the game, he continues his run of form with ‘All I Want’, now available for free download via his Soundcloud page. 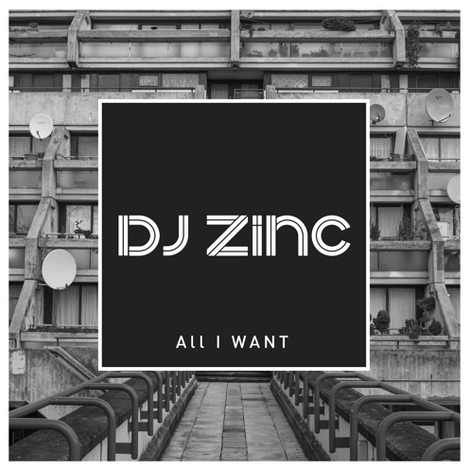 Zinc has made a career out of honing and developing his sound, with house music very much his current obsession and his latest productions, with releases on Rinse, Armada and an upcoming VA EP via his own label Bingo – including collaborations with Chris Lorenzo, MJ Cole, My Nu Leng, Shift Key and JackBeats – attest to their quality. Ahead of another Armada releases set to drop this April, his latest track is ‘All I Want’, is a bass-heavy house cut with an Amen-inflected break that tips the cap to his musical heritage.